You do realize that alot of the people this applies to have lived the majority of their lives in the US as they were brought here during early childhood and many at this point speak fluent English and broken Spanish (or another language in some cases). If you're filling a position and the candidate is qualified and you extend an offer, then when he/she is filling out the I-9 form a temporary work permit is presented....no problem right? He/she is legal to work through the duration of that work permit and at that point it sounds like would have the opportunity to extend it. It would be the same as hiring somebody who has presented a list A Work Authorization document. What is the problem with this? Wrong. All their parents have to do is have them smuggled in before they are age 16. They can have lived 15 years in their own country, often speak no English at all, and now are being rewarded with work visas while 12 million Americans cannot get jobs. What other group of people is being highly rewarded by the government because their parents broke many laws? You do realize that alot of the people this applies to have lived the majority of their lives in the US as they were brought here during early childhood and many at this point speak fluent English and broken Spanish (or another language in some cases). Please share your proof. And, not the usual propaganda claiming most Dreamies came here during infancy or early childhood. Do you not realize a person could have spent the majority of their lives in a foreign country, entered the U.S. illegally a week prior to their 16th birthday, and at the age of 20 qualify for DACA? Where do you get the idea that this only applies to recent GEDs with no experience? The program applies to people up to 31 years of age and I'm sure there is a huge variance in education and work history. Generalizing that population of people as low education and unskilled is an unrealistic assumption. Because the majority have only a GED (minimum requirement) and what legitimate work experience would they possess, seeing how they were classified as "undocumented" just a few months ago? Have you seen the unemployment numbers in the younger US citizens demographic? This screams "unfair" to allow those who are here illegally to have the same advantage (or disadvantage, as the case may be). As open as my mind is, I cannot wrap it around the illogical reasoning behind this "temporary" benefit. It's time the US stops pandering to law breakers. Period. How is someone who slipped into the US illegally when they were 14, are now 16 or 18, claim that they spent the majority of their life in the US?? When the word went out about the work visas, those 16 and older crossed the border and get forged documents to qualify for the work visas. Speaking fluent English does not translate into having the ability to write, read and comprehend. Hence, literacy/proficiency tests. Most companies also have a probationary period where they can terminate an employee at will and this is usually on the employment application that the candidate signs off on. Prior to extending an offer there is also the issue of checking with previous employer(s) where one can get information. I was a HR manager and although there are questions that cannot be asked, if phrased a certain way it can get an answer that can impact the decision. Have you read any of the posts on forums for DREAMers? 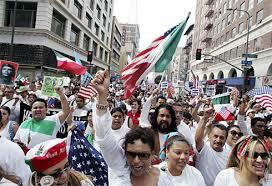 Illegals all happy happy that there were going to go get a work visa and many who were going to get their GED to get the work visa. 85% of them can't even compose a proper sentence. One of them was asking a question and she mentioned that she "snucked" into the US. The video below is about an (Mexican) American citizen (who was probably an anchor baby) whose parents returned to Mexico and she was raised in Mexico only to return to the US - the only home she knows? Because she lives in a Spanish speaking area IN THE UNITED STATES she never bothered to learn proper English (broken English and knowing 20 words isn't proper English), the same way 95% of the population in the area probably don't bother to learn English. People holding public office must speak English - that's the law. And when she was denied running for public office because she couldn't speak English - she wants to take it to the Supreme Court!!!! San Luis doesn't exist in a bubble. She's going to have to deal with other people from time to time, not just her local Spanish speaking constituency. Please share your proof. And, not the usual propaganda claiming most Dreamies came here during infancy or early childhood. Given our current economy and high unemployment, this is a no-brainer. But, it will be interesting to see if employers will choose to hire a qualified citizen, or feel obligated to hire an illegal alien with a temporary work permit. Obama cries about "outsourcing US jobs" what Obama is doing is alot worse. 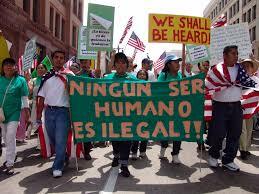 Obama is encouraging the ILLEGAL importation of FOREIGN criminals to take/steal jobs here in the USA. And that is shameful considerinfg the MILLIONS of unemployed REAL Americans and LEGAL immigrants that those jobs should go to. This traitor is selling out the American people garner a few votes from a certain ethnic group at the expense of ALL others. Yeah Right , What BS !!!! Does this look like a low profile ??? LOL..the biggest question from these hopefuls is if this temp card will let them go back and forth to Mexico to visit. ROFL. If I was in charge I'd say "yes" just so they'd leave...then I wouldn't let them come back.